Alex Barros set the fastest time for the second day running at Phillip Island as Ducati and Bridgestone dominated in Australia. 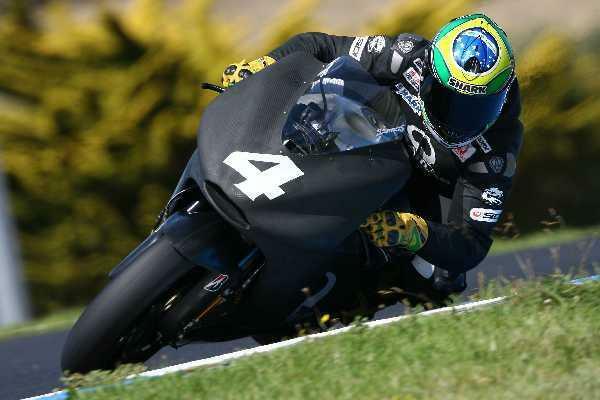 Ducati and Bridgestone riders logged four out of the top five best times today in sunny but cool conditions, with Brazilian Barros again top of the timesheets with a best of 1.30.01 in his 75-lap stint. His time though was set on a soft Bridgestone qualifying tyre and his best lap on race rubber was a 1.30.41 which would have been only good enough for the third fastest time behind factory Ducati duo Loris Capirossi and Casey Stoner. “We are making very good progress with the bike. Today my bikes were set-up completely differently and we worked a lot on geometry. But the good thing is that I was fast on both,” said Barros, who will attempt a full 27-lap race simulation tomorrow. Second fastest was Italian Capirossi, who satisfied with his progress on the new GP7, he packed up with well over an hour of today’s track time remaining. He clocked a best of 1.30.34 in 59 laps on race tyres, having failed to better that mark with two hard compound Bridgestone qualifying tyres. Stoner was third with best Honda rider being Dani Pedrosa. The Spaniard clocked a best of 1.31.35 to relegate impressive German Alex Hofmann to fifth place. Busiest man on track today was Spaniard Carlos Checa, who logged 100 laps on his way to the eighth best time as he gradually gets accustomed to the Honda V4.